Michael Jackson, king of pop and.. inventor? MJ always had a reputation for putting on a good stage show, but did you know that some of the equipment he used was so creative as to warrant a patent? In the “Smooth Criminal” video, everyone on the stage ends up leaning over at a 45 degree angle at one point, something that is normally not possible. 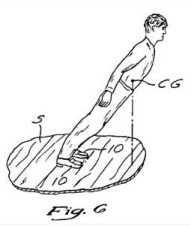 But instead of being held against the stage by the pure power of funk, Jacko actually invented a very special shoe to help pull off the trick. If you view the patent, you’ll see that the sole of the shoe had a very special notch and plate in it, and unbeknown to the public, there was a steel peg in the stage that allow the dancers to lock the special shoe down to hold their weight. Pretty amazing stuff. Here’s the video, if you watch at 3:53, you can see the shoes in action. Also, watch the guy on the right, he has problems disengaging from the floor.